There are a few different ways to add an absence for people. 1. Go to your Absences page in your top toolbar. 2. To add a new absence, click on the green 'Add absence' button in the top right corner of the page. This will open a pop up window where you can choose the employee you wish to add the absence to and fill in all the other details (start, end, type etc). To finish you can choose - to 'Approve' it now or later by clicking on 'Save'. 3. You have now successfully created an absence. It will show with the specified colour code on the Absences Calendar as well as on the Schedule calendar page. 1. Go to the Schedule calendar and right click on the person's row to whom you wish to add an absence for. From the options that open click on 'Add absence'. 2. A pop up window will open where you can select the absence type and fill in other relevant information. The absence will show on the Schedule calendar as well as on the Absences calendar page. 1. Go to your People page and click on the employee's name you wish to add the absence to. This will take you to their profile. 2. Right next to their main information, you will see their Absences graph. In the bottom right corner of it there is an 'Add' button. Click on it. 3. 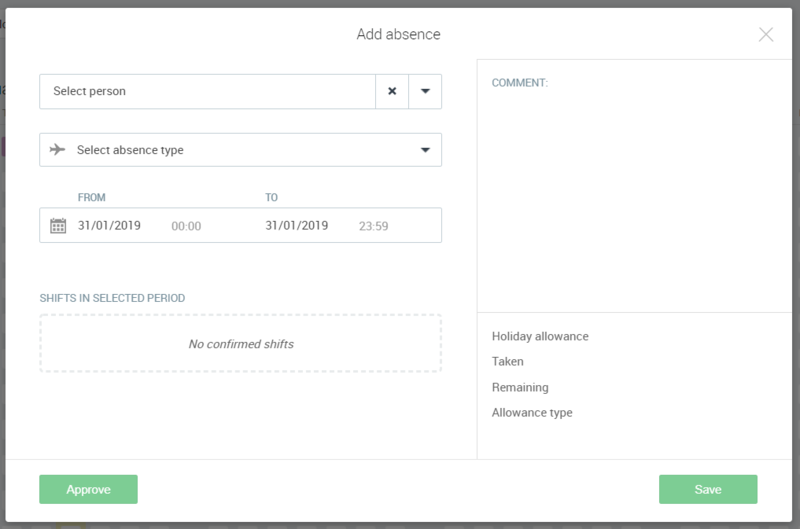 This will open up the same pop up window as when adding an absence on the 'Absences' page where you can fill in all the details about the absence. 4. Fill everything in and then click 'Save' in the bottom right corner. You have now have created a new absence for this person.